Thomas Engqvist is an international master from Sweden, who has been a chess coach and teacher for more than thirty years. He has worked with players at world championship level in both junior and correspondence chess. The material originated as an email course aimed at Swedish juniors. Engqvist writes that he wanted to “distill the most important positional ideas and techniques” with solutions presented in a “pedagogical and easy-to-learn fashion in order to facilitate comprehension.” He suggests that there are several important ideas to be learned from any one key position, and these ideas or techniques can then be applied in many other situations. When this strong move was played by Capablanca it was initially regarded as a mistake by both critics and onlookers. The main reason was that it reduced Black’s influence on the d4 square and therefore made the advance of the d5 pawn more difficult. Also the d5-pawn itself had became weaker. However, Capablanca realised the value of the move and described it in detail in My Chess Career. White’s general plan was to put pressure on the hanging pawns with his rooks on c1 and d1 and Black would defend the pawns correspondingly by placing his rooks on d8 and c8. The e7-bishop defended the c5-pawn. Capablanca asked himself if it was possible to activate Black’s position and that is how he found 15…c4. The important point of Capablanca’s revolutionary move is that the e7-bishop becomes an active piece. Another important point is that the b2-pawn becomes a tactical weakness which Black can attack along the b-file. A third important issue is that if White blockades the d5-pawn by placing his knight on d4 the attack on the d-file is temporarily stopped. In addition to these arguments Nimzowitsch wrote in his classic My System that 15…c4 makes the hanging pawns relatively secure because after this move Black has only one weakness instead of two. Capablanca recommended 16.e4 to simplify the game but Bernstein preferred to put pressure on the centre, since it was regarded as a good policy, and played for a win. This is one of the points of Black’s 15th move. Black plans an exchange on c3. Black’s d5-pawn has now been transformed to a passer so his overall strategy has certainly been successful. 20.Rc2 Bxc3 21.Rxc3 Nd5! 22.Rc2 c3 23.Rdc1 Rc5 24.Nb3 Rc6 25.Nb4 Rc7 26.Nb5 Rc5 27.Nxc3?? Nxc3 28.Rxc3 Rxc3 29.Rxc3 Qb2! White resigned. A very important game to memorise since it illuminates several ideas regarding how to play with hanging pawns. These ideas are important to know whether you are White or Black. 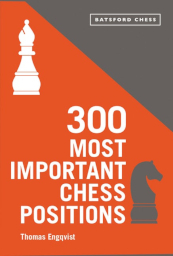 300 Most Important Chess Positions is a book that can last a lifetime. The reader can return to it continuously to refresh their understanding of key positions and sharpen their practical playing skills. As Engqvist says, “you need to integrate the positions into your conscious chess thinking.” He recommends to play out the positions with a friend or a computer from both sides of the chessboard, and he even provides contact information for feedback for future works. Highly recommended.